I don't think it's any surprise around here that I love comic books. They captured my imagination when I was a kid, and 30ish years later, they still capture my imagination. Over the years, the stories have grown up too (at least, I think so), and characters and trends have come and gone, and my interest has waxed and waned, yet I always come back to them. And I hope that they continue to capture my imagination far into the future, because they can seriously just be so much damned fun! So, when I first heard about A Once Crowded Sky, I couldn't wait to get my hands one it. The book blurbs had said that Tom King, a former CIA agent who also worked as an intern at Marvel Comics and DC Comics, has written a book that takes everything that's great about comic books and put it into literary fiction. And you know what? They were right. A Once Crowded Sky is the story of PenUltimate, the last existing superhero in Arcadia City, the only hero to still have his powers and who would still be able to play in the great and wonderful game of superheroes and villains, if there were any left. But, there are not. He is the last. And why is he the last, you ask? Well, all I can say to that is, "Spoilers!". I actually can't go into a whole lot of the plot or storyline in the book, for just that reason. The story plays out as it needs to play out, and I'm afraid that if I were to give anything away, I'd be ruining something. So, I'll just talk about my feelings during and after reading. First off, King plays by the rules of comic books in his story. The heroes fight the villains, fight amongst themselves, save the day, do the impossible, and start all over again next month. In this world, the rules of the comic book and the monthly publishing timeline work to their advantage. This is something that I particularly loved about the book, their inner knowledge that this is how things worked in their universe. All the superheroes understand this, and that's part of what is hard for them, now that their powers are gone. They're very self-aware of their part to play in the grand scheme of their universe, and now that it's gone, they are trying to piece their lives back together as best they can. King does such a great job of writing this as a comic book come to literary life, that when I was reading it, I had the same feeling of "so much damned fun" that I get when I'm reading a really well written/drawn comic book. He understands the pacing needed to make a good comic, and translates it perfectly into literary form. As more of what is happening in the background of the story and more is revealed to what the whole story was about, that feeling just continued to grow. Everything about this book is just "so much damned fun"! However, the great thing about this book is that King has written it in such a way that even those who are not fans of comic books could enjoy it. I'd really like to see more form Tom King in the future. If this is what we're getting from him on his literary debut, I'm anxious to see what he can do next. 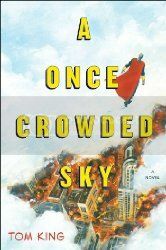 A Once Crowded Sky will be available from Touchstone Books on July 10, 2012.